Saturday morning, I presided at the funeral Mass for Father James Degnan at St. Patrick’s Church in Lawrence. 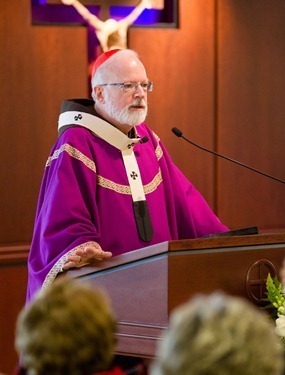 Father Bill Kremmel gave the homily. 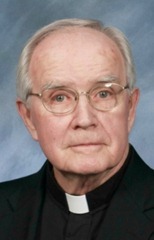 Father Degnan was a beloved pastor in Hopkinton for over 25 years, and for the last several years had been helping out in his hometown of Lawrence. 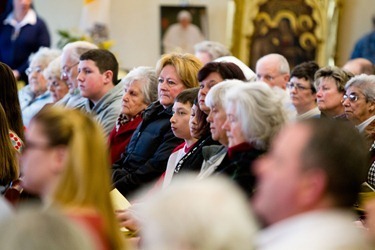 I was happy to see that many of his parishioners from Hopkinton came for the funeral. He had a great love for his family. His nephew, Lenny, who was so close to him and so good to him, was there. 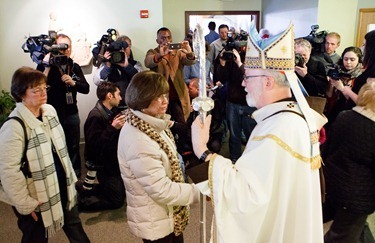 It was a very beautiful sendoff for Father Degnan. 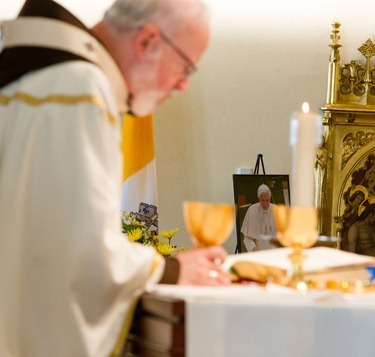 Everyone spoke about his great joy, his love for his faith and the priesthood and how he brought his good humor and his love of music to the people. He was gifted with a beautiful voice that he shared very generously with people. Of course, being at St. Patrick’s is always an opportunity to see the wonderful work that is being done there by Father Paul O’Brien and his parishioners with their outreach to the poor. The Cor Unum Meal Center has made such an impact on the local community there and receives so much support, so many volunteers. It really answers a very pressing need and at the same time captures people’s imagination as a way of living out their faith and serving those who are less fortunate. 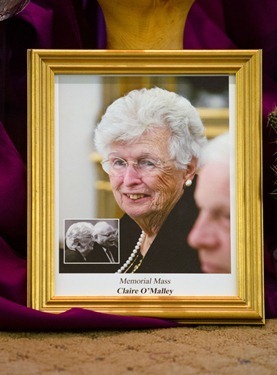 Last week I also joined many people from the Archdiocese, Boston College and the Greater Boston philanthropic and business communities in marking the passing of our dear friend Giles Mosher. 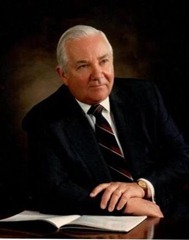 He was a steadfast supporter of the work of the Church and always concerned for the good of all people, especially those in need of assistance We extend our prayerful condolences to his beloved wife Thelma and all his family and friends. 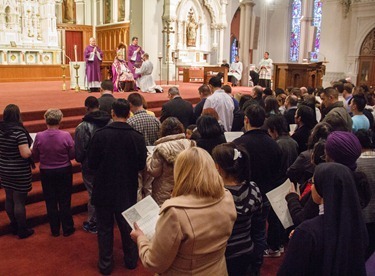 Sunday morning, we had Mass with the Carmelite Community in Roxbury. I told them that my titular church in Rome is a Carmelite church that I always wanted to bring back to Boston. But I told them I did not need to, because I have two cloistered Carmelite communities here. The Gospel of the day was the story of Christ in the desert. 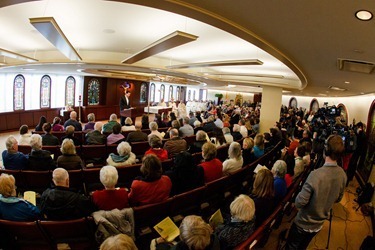 In my homily, I explained how the different scenes from Jesus’s life play themselves out in the charisms of the different religious communities: Jesus’s caring for the sick and healing is reflected in the nursing orders; Jesus’s blessing the children and teaching is seen in the teaching orders; but Jesus’s experience in the desert, on the mountain and in the Garden of Olives shows us the contemplative aspect of his life. This aspect is reflected in the religious life of the sisters whose witness to prayer is so valuable to all of us. It is always inspiring to listen to the petitions that are part of the celebration of the Eucharist with the Carmelite Sisters. You see that they are lifting up in prayer so many people from around the world in their material and spiritual needs. In fact, one of the reasons I wanted to be there during this time was to ask for the sisters’ prayers for the conclave, the Church in this time of transition and for our Holy Father as he steps aside from responsibilities of guiding the Church. Then, in the afternoon, we celebrated two sessions of the Rite of Election and Call to Continuing Conversion at the Cathedral the Holy Cross. 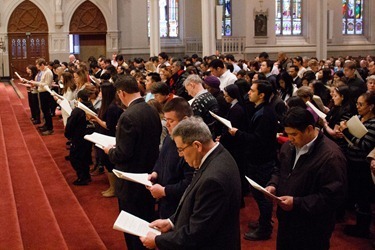 This year, the number of people entering the Church is actually up, however, the bad weather that day kept some people from attending the ceremony. 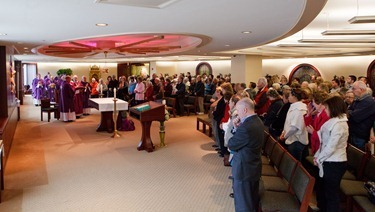 The celebration is always an uplifting experience that I think is much appreciated by our new Catholics who catch a glimpse of the cross-section of the Church. 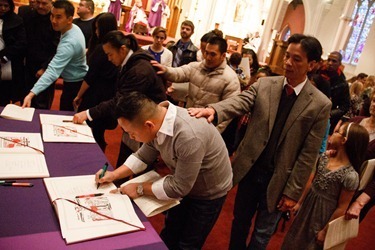 Those participating in the Rite of Election represent such a wonderful cross-section of the archdiocese, coming from the Korean, Hispanic, Chinese and Brazilian communities, just to name a few. 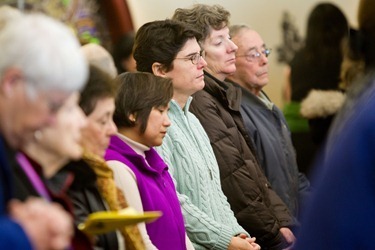 Those who are taking this step of responding to the grace to enter the Church see that they are not alone and that the whole community is accompanying them on this Lenten retreat, which is a baptismal retreat of preparing ourselves to receive the Easter sacraments. 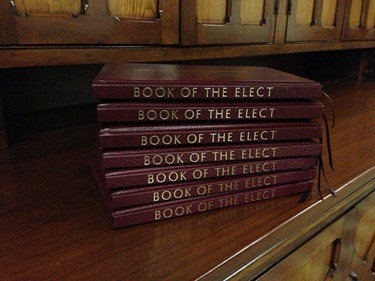 The Rite of Election is a wonderful way to begin Lent. 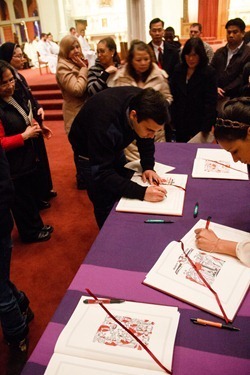 It reminds all of us that Lent is a call to conversion and a call to deepen our own baptismal commitment. For that reason, we are once again running “The Light Is On For You” program throughout the archdiocese. In all of our chapels in parishes, confessions are available from 6:30 to 8 p.m. every Wednesday evening during Lent. 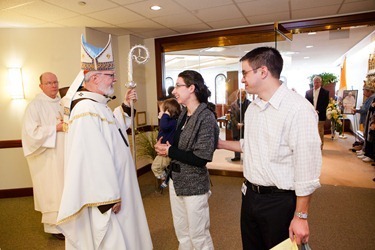 We want to encourage everyone not only to take advantage of this opportunity for themselves, but also to spread the word, particularly to people who have been away from the sacraments. Lent is such a wonderful opportunity to reconnect with the Lord and receive his healing grace. On Tuesday, I was at Catholic TV studios recording a number of programs. One of them was for Catholic Extension, which does so much for the home missions. 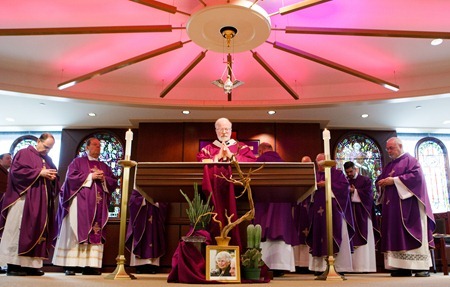 Catholic Extension supported me when I was Bishop of the Virgin Islands. 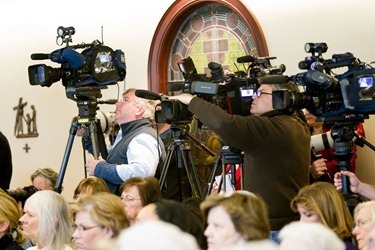 As always I tell people, when I was bishop of that mission diocese our entire diocesan budget was $30,000 and without their help I don’t know what we would have done. So, I was very happy to lend my support to them. 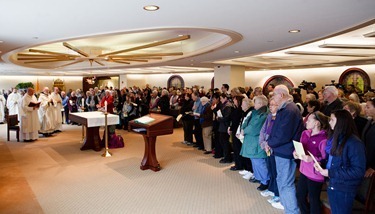 Wednesday, we celebrated the month’s mind Mass for Claire O’Malley in the Pastoral Center’s Bethany Chapel. 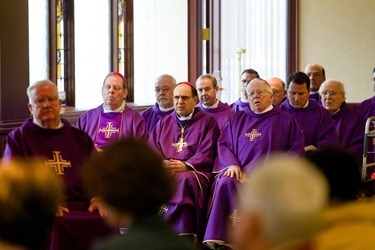 I was very grateful for all the priests, bishops and lay people who came together for the celebration. 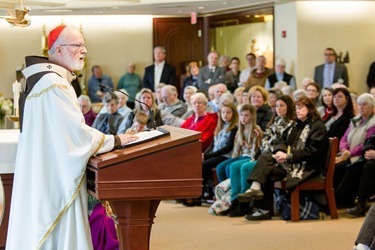 I know there were many people who were not able to come to Florida and it gave me an opportunity to publicly express my gratitude for the many expressions of sympathy, condolences and promises of prayers that my family received from people in the archdiocese. Thursday morning we had one of our regular Presbyteral Council meetings. Among the items at the meeting was a presentation by Dr. McGonagall who will be working with us implementing wellness programs for our priests. It is important, even with all they have to do, that our priests take the time to take proper care themselves. 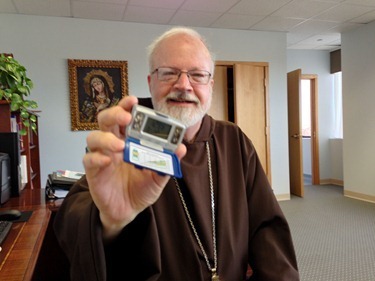 For example, I was recently given this pedometer. So I will be measuring how many steps I make. 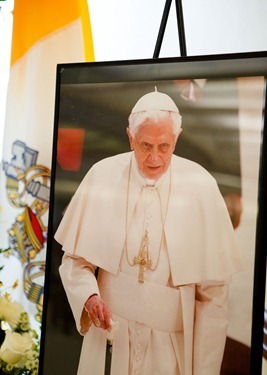 This afternoon, at the Pastoral Center we celebrated a Mass for the Feast of the Chair of Peter, praying for Holy Father Pope Benedict XVI giving thanks for the gift of his ministry and asking for God’s blessing upon him. As I prepare to leave for Rome, I am very grateful for all the promises of prayers I have received. 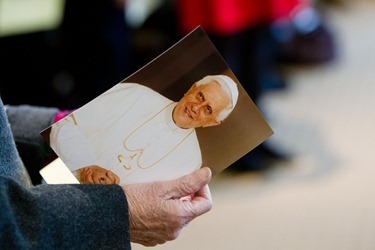 I realize that there has been much speculation about who will succeed Pope Benedict. However, I deem that to be very fanciful. 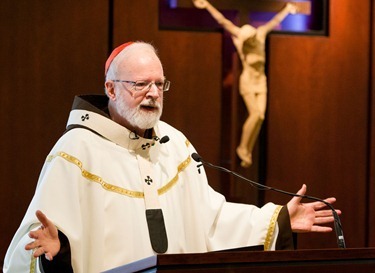 Instead, we should be concentrating on praying for the Holy Spirit to help and guide the cardinals so that we will elect the person the Church needs at this moment. I know people like to root for the home team — who wouldn’t want the pope to come from their home diocese — and, of course, I am honored to participate in the conclave. But, I assure everyone, no cardinal goes to the conclave with ambitions to be elected the Holy Father. Our only ambition is to try to be open to God’s grace so that we can make the right decision. 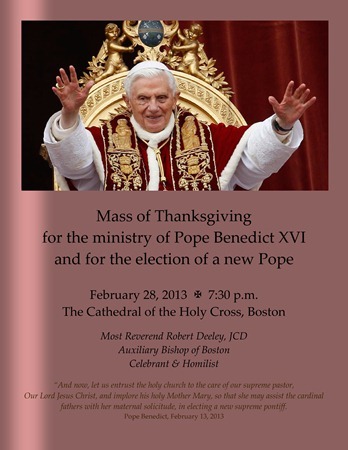 I want to conclude this week inviting everyone to a Mass marking the last day of the Holy Father’s tenure on Thursday, February 28 at the Cathedral of the Holy Cross at 7:30 p.m.
That Mass, which will be celebrated by Bishop Deeley, will be offered in thanksgiving for Pope Benedict’s ministry and to ask God to bless him as he begins his retirement.